Eid al-Adha is just around the corner – so let’s review an Eid Nasheed. Many well-known artists have songs about the festival of Eid – examples include Sami Yusuf’s Eid Song, Zain Bhikha’s Eid Un-Sa’eid and Eid Mubarak by Safe Adam. 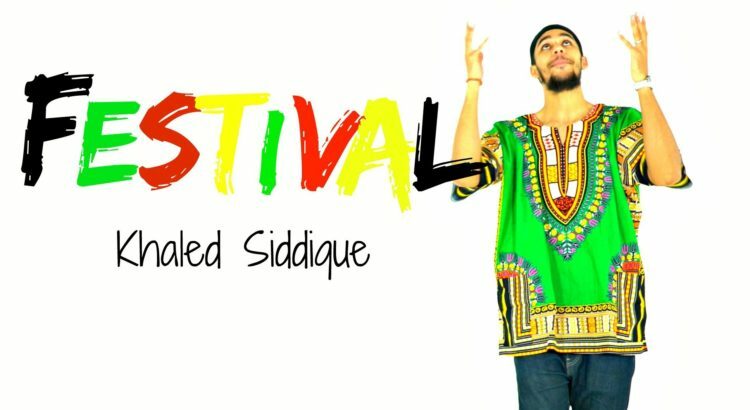 The track by Khaled Siddiq, in my view, tops them all. Eid is a time to celebrate and come together – this energetic track can certainly help in giving you that Eid spirit! The track is lively, up-beat and celebratory in nature. One of the most interesting qualities of this track is that it contains no musical instruments. Really? I’m sure I hear music? Nope. All sounds are actually produced through the mouth alone, as stated at the beginning of his music (or non-music) video. The use of musical instruments is a debated issue amongst Muslims around the world. Some believe there is nothing wrong with instruments, or make an exception for the duff; while others avoid it all together – by producing a high quality track with no music Khaled has ensured everyone is happy! The lyrics express excitement and anticipation for the coming of Eid. It takes the listener to the last night of Ramadan, where many feel a sense of energy, but are also sad to see the blessed month depart. With a balance of deep and comical lyrics, Khaled has produced a track that will surely be listened to by many for years to come. The video features a variety of people of different colours, ages and ethnicity. The singing is pretty fast. The lyrics have been presented below, let’s go through them calling out any references to Quran and Hadith. Another common debate in Islam is the sighting of the moon. Some believe we can use modern technology to calculate the arrival of the new moon, while others argue that it should be seen with the eye. Hilarious! Alcohol is a common way to celebrate in the west, but forbidden in Islam. This results in many Muslims coming up with innovative ways to celebrate. Did you know that Alcohol was a common drink at the time of the prophet Muhammed (pbuh)? Then a verse came down banning alcohol all together. It was said that there were rivers of Alcohol flowing through the street after this verse was revealed. Great lyrics. All three of the phrases appear in the Quran. Prayer is important. It’s one of the pillars of Islam. Something as simple as a smile is of great importance in Islam. Did you know the prophet used to smile often? There are narrations to suggest that one should wear their best clothes on Eid. Al-Haafiz Ibn Jareer (may Allah have mercy on him) said: Ibn Abi’d-Dunya and al-Bayhaqi narrated with a saheeh isnaad going back to Ibn ‘Umar that he used to wear his best clothes on the two Eids. Ever wonder why many Muslims say InShaAllah at the end of every sentence? We are told to never make an intention unless we say the phrase after it. It’s rare to find a track that contains no music but still sounds good and full of energy. I hope it helps people to celebrate Eid in a Halal way, favouring Islamic music over mainstream tracks in their celebration. Kun Anta by Humood – I don’t speak Arabic but love it!